A parliamentary panel has said the 'bridge course', proposed in the National Medical Commission (NMC) Bill, to allow practitioners of alternative medicines such as homoeopathy and ayurveda to practise allopathy, should not be made a mandatory provision. The committee also recommended penal provisions for those practising medicine without requisite qualification. Noting that every state has its own specific healthcare challenges, the panel recommended that the state governments may implement measures to enhance the capacity of existing healthcare professionals, including AYUSH practitioners, B.Sc (Nursing), BDS, B.Pharma and others to address their specific primary healthcare issues in rural areas. The recommendations were made by the Department-Related Parliamentary Standing Committee on Health and Family Welfare in its report on the National Medical Commission Bill 2017, tabled in Parliament today (20-03-2018). The NMC Bill, 2017, which seeks to replace the existing apex medical education regulator, the Medical Council of India (MCI), with a new body, was moved by the government in Parliament on December 29. Following opposition from the medical fraternity over different provisions of the proposed legislation, one of which was the 'bridge course', the Bill was referred to the Parliamentary Standing Committee. The provision of the Bill was strongly opposed by health bodies, including the Indian Medical Association (IMA), which claimed that allowing AYUSH doctors to practice modern medicine would promote "quackery", although the ministry of health had stated that the provision seeks to address the "acute shortage" of doctors in the country. "The committee is of the view that the bridge course should not be made a mandatory provision in the present Bill," it said. The panel, chaired by Ram Gopal Yadav, however, acknowledged the need to build the capacity of existing human resources in the healthcare sector, to address shortage of professionals. The ministry had said the NMC Bill seeks to fill in the gaps of availability of healthcare personnel by facilitating trained AYUSH practitioners to expand their skill sets through a Bridge Course and provide preventive allopathic care. The bridge course may help address this demand and better utilisation of resources while making the health sector a bigger provider of employment, it has said. The NMC Bill also promotes this through raising exposure patients suffering from non-communicable diseases to non-allopathic practitioners in addition to allopathic doctors. In its views expressed to the committee, the ministry said, "India has a doctor-population ratio of 1:1655 as compared to WHO standards of 1:1000. In addition, city doctors are not willing to work in rural areas as can be seen in the Urban Rural ratio of doctor density." "There are 7,71,468 AYUSH practitioners in India who can be leveraged to improve the health access situation of the country," it said, adding AYUSH has an effective role in integrating preventive and promotive aspects of healthcare. With growing incidence of non-communicable diseases, there is a need to provide holistic prevention and treatment of diseases, it said. The ministry also talked about countries such as Thailand, Mozambique China and also of New York city which have regularised community health workers or non-allopathic health providers into mainstream health services, with improved health outcomes. India also need to take such kind of steps due to acute shortage of doctors and specialists, it said, adding that in order to regulate the entry of AYUSH professionals in practising modern medicine, through a strict regime, this bill has provided for a clause. The panel was informed that a bridge course will be introduced only by a unanimous vote as provided in Section 49(4) and hence each one of the allopathic doctors in the NMC will have veto power. Various states such as Maharashtra, Assam, Uttarakhand, Haryana, Karnataka and Uttar Pradesh have already amended their laws and permitted AYUSH professionals to practice modern systems of medicine. 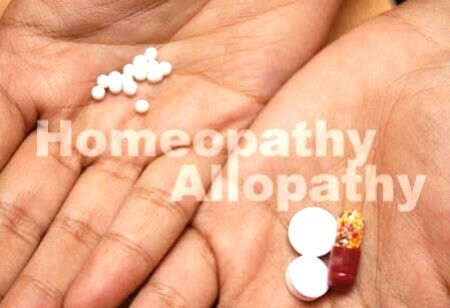 The Bill also calls for a joint sitting of the National Medical Commission, the Central Council of Homoeopathy and the Central Council of Indian Medicine at least once a year "to enhance the interface between homoeopathy, Indian Systems of Medicine and modern systems of medicine". The proposed legislation has also proposed that specific educational modules or programmes for developing bridges across the various systems of medicine and promotion of medical pluralism, can be done with the approval of all members present in the joint sitting. According to the Bill, "The joint sitting, may, by an affirmative vote of all members present and voting, decide on approving specific bridge course that may be introduced for the practitioners of Homeopathy and of Indian Systems of Medicine to enable them to prescribe such modern medicine at such level as may be prescribed.